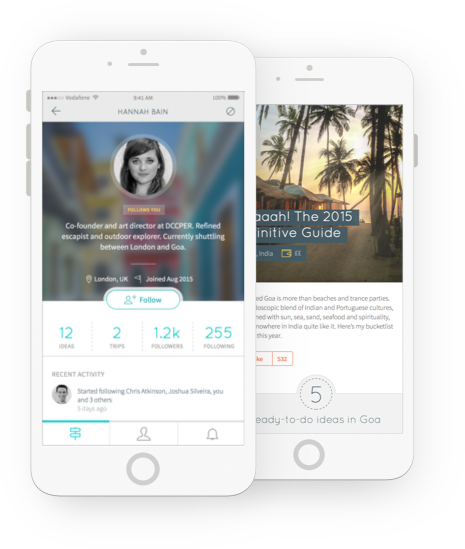 An iOS app for a UK startup that makes planning trips and sharing travel ideas fun. Faraway is a geolocation-based iOS app for planning vacations and trips. Crowdsourced ideas and things-to-do form the basis of the app. Users can then create lists of activities by stringing these ideas together or creating their own. It has a strong social flavour, and allows for connecting and sharing itineraries with other travellers. We worked as cofounders on the strategy, design and development of the iOS app. We created a completely custom UI influenced by AirBnb, Oyster, Instagram and others — while still following Apple’s HIG. DCCPER has worked so well for us because they’re our co-founders, and so it feels as if it’s their baby as much as it is ours. We can see this in the care, attention and creativity the team has put into the project, the way they’ve challenged our thinking and brought new perspectives to the idea, and also the fact that we’ve built a friendship as well as a working relationship.